The HAND CHECK PAD simulates press coverage at the line of scrimmage. Use it to teach Receivers to get off a jam with a variety of escape moves. Also used as a target by D-Lineman to practice the rip, club and chop moves. Slide your arm inside this pad and grab the inner handle. 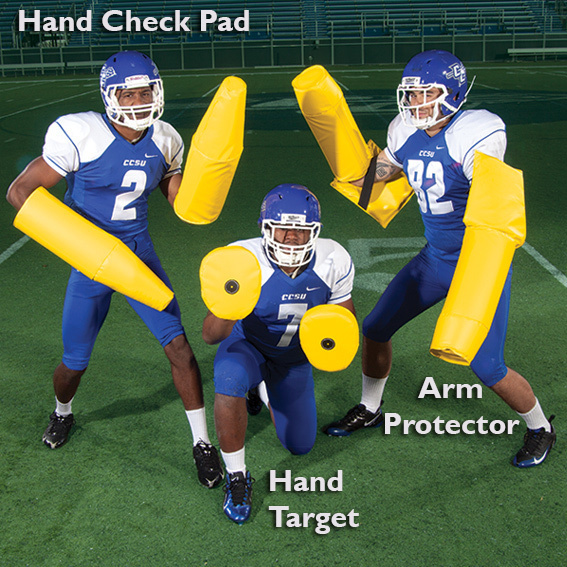 Offers total arm protection (total arm protection up the forearm to the bend in the arm). Measures 8" in diameter by 25" long. Sold as pairs. "The coaching point is to teach escape moves against press coverage!"